Now that Apple released iOS 4.3 update for download you can set up the most awaited home sharing feature in your iPhone, iPod Touch and iPad. Home sharing option will let you stream music movies, pictures and other media files in a wireless private network. That means you can share an iTunes library from a PC or Mac to compatible iPhone, iPod or iPad. 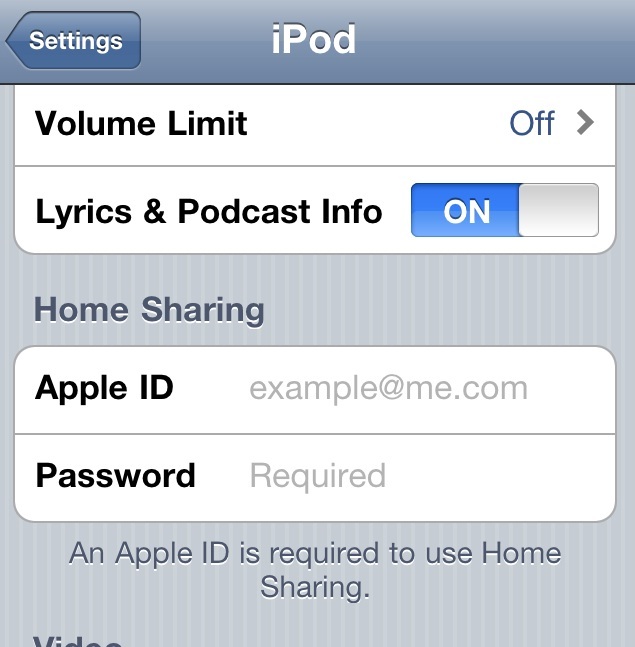 Follow these steps to set up home sharing in iOS 4.3 devices. Find the settings for the iPod music player in your idevice. 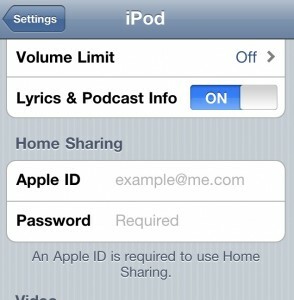 As shown above, enter your Apple ID and password in Home Sharing option. That’s it – you have set up your idevice to stream your iTunes library wirelessly over WiFi. Just go to iPod app> More> Shared> click on a listed Library. Now you will be able to play songs and videos from that desktop iTunes library using iPod Music player.